For even more history read this blog post by Peter Ruddock. A Local Garden Share is held every Second Saturday from 1:30 PM to 2:30 PM, year-round, at the Common Ground Garden in Palo Alto. This event is supported by a coalition of community ecological organizations and neighborhood groups including: Common Ground Garden, Transition Palo Alto and Transition Silicon Valley. 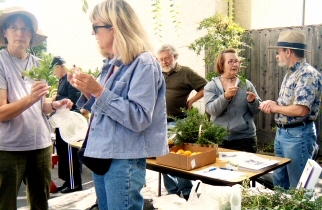 A Local Garden Share is held every Fourth Saturday from 10:00 AM to 11:00 AM, starting in April, 2013, at the redwood grove in the town center of Portola Valley. This event is supported by the Town of Portola Valley. A Local Garden Share is held every Fourth Sunday from 11:00 AM to 12:00 PM, from January through November, at Full Circle Farm in Sunnyvale. This event is supported by a coalition of community, ecological, and neighborhood groups including: Acterra, Full Circle Farm, Summer Winds, Sunnyvale Cool, and Transition Silicon Valley. We hope to expand to other locations in the future. Join us to share garden bounty. Bring what you have to share; take home something you don’t. Think of it as a free backyard farmers market. Come even if you don’t have anything – later you will have something and those who have something now won’t.